You know how people say that store brands of a product are just the same national brand in plain packaging? Whatever. 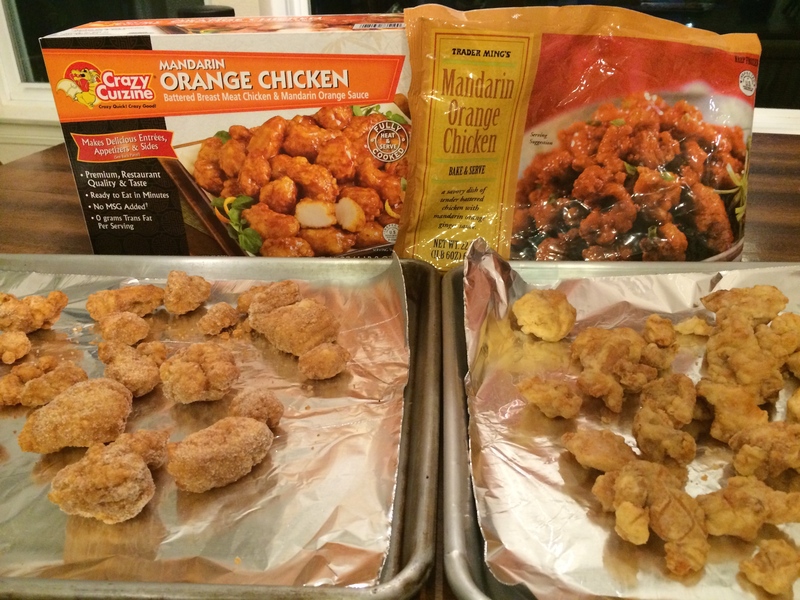 I just bought the Mandarin Orange Chicken from Costco’s freezer aisles completely on impulse even though I had some at home already from Trader Joe’s. Mandarin Chicken from Pick Up Stix take out, and frozen, ready to bake from Costco and Trader Joe’s. All three had something big going for them in that they are all fried. Let’s face it, if it is fried, I’m there. You could fry a dirt clod and I would probably eat it, most certainly if it has gravy. Yep. None of us cared for the Pick Up Stix. It just didn’t taste as good as the other two, according to the girl, while the boy and I really, really don’t care for water chestnuts. I will point out his puny taste buds and that he also for swore the take out was too spicy. Wimp. I think he was just still mad that I went to the wrong take out place- apparently I mix up Panda Express and Pick Up Stix easily, so, oops. The girl liked the Costco (because she likes white meat), the boy liked the Trader Joe’s (he prefers dark meat), I liked both so it is officially a tie. The husband didn’t get a vote since he wasn’t home yet and I wanted to put up today’s new thing on the blog. We will make him eat the leftover Pick Up Stix for lunch- that’ll teach him not to be home when we want to try something new!